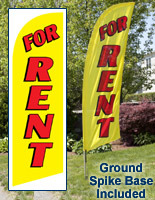 This real estate flag selection includes banners with many different messages for a variety of properties. 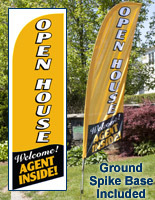 Today's housing and commercial building market is extraordinarily competitive, as any agent's experience will confirm. 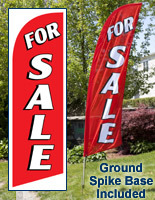 The real estate flag is the ideal way for sellers to draw attention to their listing in markets with an oversupply of sellers, and an undersupply of buyers. 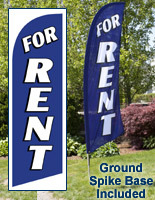 Advertising banners for properties for sale, rent and lease are all available. 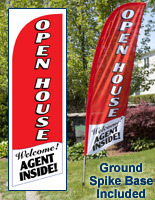 Why offer real estate flags with so many different messages in several different colors? 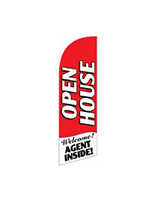 The reason is because each agent knows the specifics of their pool of potential buyers and what promotional marketing mix will work best in the area. 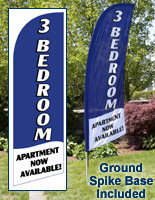 These real estate flags, also called advertising banners, are specifically designed for realtors. 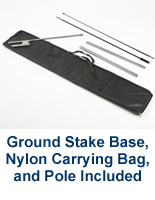 The flagpoles break down into four pieces to fit into the carrying bag, which is included with each unit. 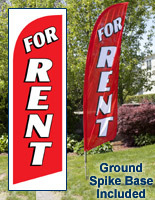 All components of the real estate flags fit inside the black bag. The ground spike and polyester pennant fit inside the carrying case as well, yet the bags weigh only approximately 4 lbs. 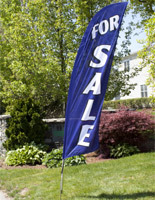 Until the introduction of these real estate flags, agents usually only used yard signs to advertise properties for sale or open houses. 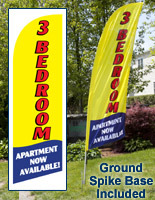 However, the convenient design of these displays makes it practical to use large outdoor advertising banners for properties. 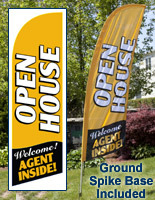 Realtors will find the banners and poles assemble quickly and easily. 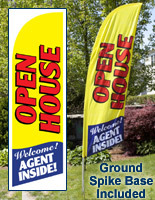 Each real estate flag was engineered for frequent set up and break down so agents can use the advertising banner over and over again at every open house. 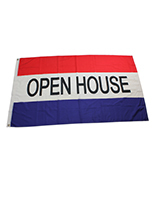 Once the open house is complete, each banner will fit inside the trunk of a standard size car for storage until the next property! 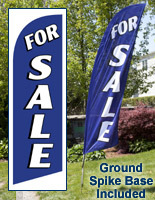 Why advertise homes for sale with a real estate flag instead of a yard sign? 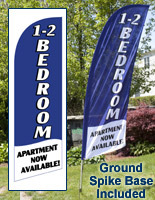 The large size is far more visible than small signage that may measure 22" x 28" at most. 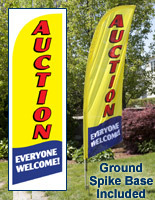 Colorful and exciting when contrasted with a traditional for sale sign. 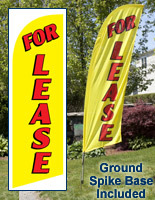 Agents can practically place multiple banners in the yard to create a custom display. 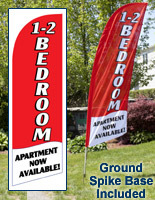 Each flag has large bold letters that are easy to read compared to a yard sign. 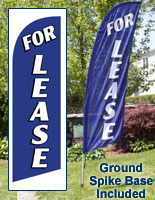 For a company with a property for sale in a busy business district, yard signage is too small. 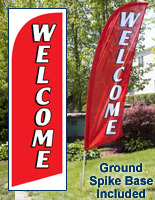 Outdoor flags weather resistant, and easier to see in inclement weather. Since 1974, this company has collaborated with individuals and businesses selling goods and services in point-of-purchase environments. 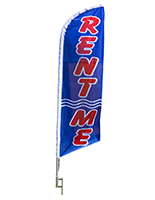 The extensive compilation of real estate flags for sale in this category has been developed by company merchandisers and marketers to include all the possible custom messages an agent may need, no matter if they are selling, renting or leasing a property. 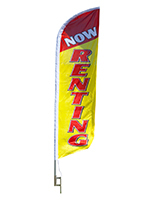 Additionally, flags with messages such as "1-2 BEDROOM", "OPEN HOUSE","WELCOME", "FOR LEASE" and "FOR RENT" are all available as well. 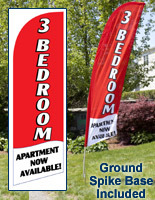 Furthermore, each advertising banner comes in a variety of colors and with various messages in smaller text below the vertical large text of the main message. 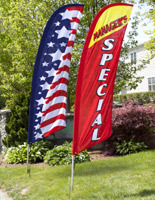 Color options include red, white, blue, yellow and even orange! 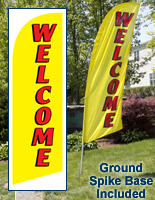 Why are so many variations of custom banner offered? As many agents know, every detail of a property management and sale is critical when trying to generate interest in a company or residential building. Therefore, the displays used in promoting the property need to match the style of the target market segment that will be interested in the home. Why buy from this company instead of a large online super store? 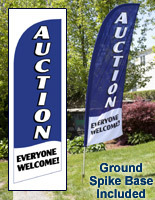 This online catalog specializes in custom and stock POP advertising equipment. 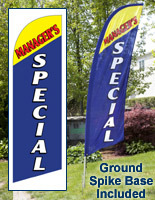 Displays2go offers specialized consumer service by a knowledgeable in-house staff. Display fixtures for use in conjunction with blade message banners are sold on this site. 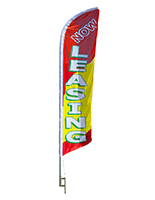 Custom feather pennants are offered in addition to these pre-printed units. Decade of experience gives this company superior knowledge of what works for advertisers and property agents. 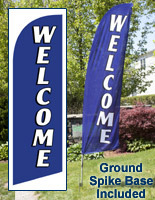 The flagpoles included with each message banner have an aluminum and fiberglass construction for a lightweight design that makes transportation to different properties easy when the carrying bag is used. 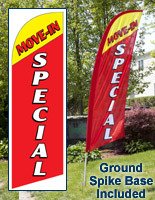 The various sections of the flagpoles fit into each other for quick assembly and break down. 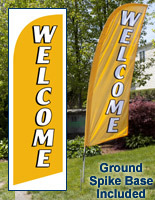 Each pennant has a cord to connect to the flagpole. 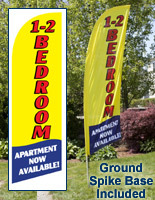 In windy conditions, this mechanism prevents the signs from flying off the poles. 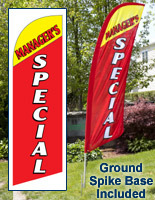 Each ground spike is long to penetrate deep into the ground to stabilize the unit in windy conditions as well. 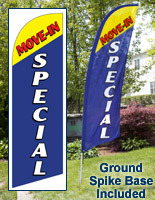 Flagpoles then slide snuggly onto the ground spike. 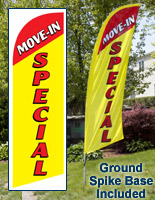 No matter if your customer wants to rent or sell their home, this online selection features many different banners to help get the deal done! 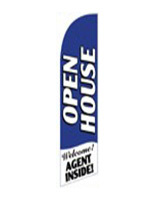 Potential buyers will flock to the next open house or property showing when they see a series of blade banners advertising the home! 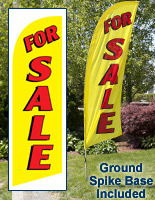 Realtors have found the ideal display supplier in this company! 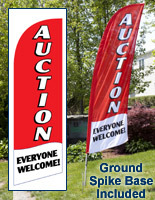 Not only are many advertising options available when shopping on this site, but also the wholesale prices make creating a custom arrangement of outdoor property advertising equipment possible! 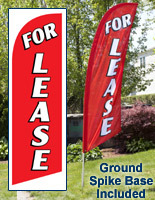 The traditional yard sign is also for sale on this site for properties located in neighborhoods with restrictions that may not permit the use of tall displays, such as the feather banner.